At the beginning of every year, I love looking back at all my posts that you enjoyed reading! 2015 has been another busy year of crafting, learning, exploring, and just having fun. I present to you our Top Ten Crafts and Activities of 2015. I hope you like going through this list as much as I did, and catching up on anything you missed seeing. 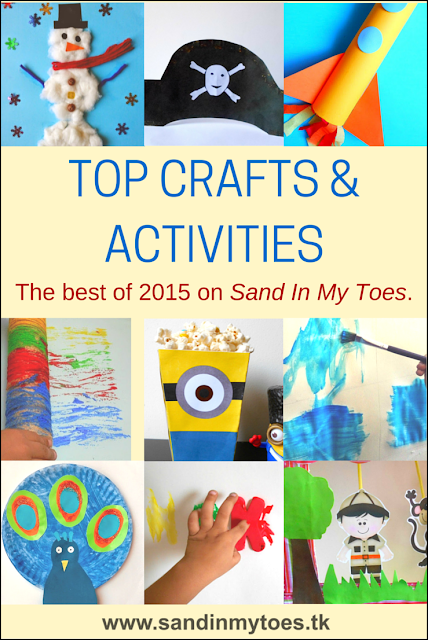 Top 10 Crafts & Activities from Sand In My Toes in 2015! 10. We celebrated an Indian festival with a Paper Plate Peacock craft, representing India's national bird. 9. Our Yarn Roller Printing process art project was so pretty, and a fun activity to do at the same time. 8. This Letter Stamp Painting activity was great for letter recognition, while having fun with colours. 7. We turned an old cereal box into an awesome Jungle Puppet Theatre that led to hours of imaginative play. 6. The Minions were back, and we celebrated the movie with a Minions Popcorn Box. You can download the free template and make some for yourself! 5. Another letter recognition activity Little Dude enjoyed doing was Hidden Letters Painting, using a simple resist painting technique. 4. We also loved making our Flying Rocket Craft, complete with 'fire' as it blasted off into outer space (or so we like to imagine). 3. Our Snowman Texture Art has been popular for two years running, and I do like how cute it is! 2. We also created a Ramadan Kindness Calendar for the Islamic month of fasting. It was quite popular, and the free downloadable calendar can be used by anyone looking for ideas on kindness acts. 1. And our most popular craft for 2015 was the DIY Pirate Hat we made for pretend play. It's quite simple to make, and so much fun! 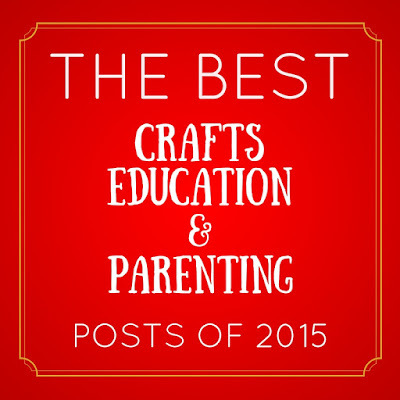 This post is part of an initiative by Top Kids Bloggers to bring you their Best Crafts, Education, and Parenting Posts of 2015.